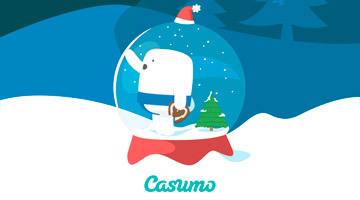 Casumo– a Casino, one of Offersille’s top picks of 2016, is celebrating Christmas with a seasonal slot game and a feast of promotions throughout December. Straight from the Game Studios of one of the world’s leading slot providers, NetEnt, comes Secrets of Christmas. This 25 line, 5 reel slots game, available on desktop, tablet and mobile is stuffed fuller than Santa’s sack with features to keep you going through Christmas and into the New Year. As you would expect from NetEnt the game is beautifully designed with twinkling Christmas lights, and Xmas symbols. Alongside the standard playing cards are bells, milk, cookies and gingerbread houses, sacks stuffed full with toys, and Father Christmas himself. You can play from just 25p up to stakes of £125 a spin. Your favourite (?) Christmas songs play along in the background whilst you spin the reels. So you may want to know that you can turn the sound off in the settings if you choose. Look for the bell symbol when you’re playing. This is the highest value of the lot and brings in 1250 x your stake for 5 in a payline. Meanwhile, Santa is the wild symbol, substituting on all reels for any other symbol except the scatter. Of course it wouldn’t be Christmas without some nice presents. And what better present than Free Spins for an ardent slots fan. Free Spins come when the Scatter symbol – the sackful of toys – appears 3 or more times in any position on the reels. When the scatters appear you’ll also get to unwrap more presents in the form of up to 10 more free spins, 1 or 2 x multipliers or wilds. And there’s some nice combinations in there to bring in some big wins. Overall there’s some pretty tasty treats in store for anyone who fancies having a go on Secrets of Christmas Slots, over the festive season, or thoughout the year. Meanwhile, as you’d expect from Casumo, there are of course some very rewarding Reel Races happening through December. Every day at 7pm a £2,000 Reel Race is the headline event. Alongside that are the usual daytime and evening races with heaps of prizes up for grabs. If you’re not already a member of Casumo, here at Offersville, we truly recommend this new-look casino to all our readers. New players will get 20 free spins on Starburst Slots, plus a further 180 free spins and up to E1,200 bonuses when you start depositing. To get the full lowdown on this site, read the Offersville Casumo Casino Review. Up to £100 Bet Credits for New Customers. Apply Now!